I think it’s good to review things every now and then, and I like the idea of sharing my favorite images from the year that was… so here’s the 2018 version. I didn’t take all that many pictures this year, at least compared to a “normal” year for me, but I think I did take some quality images when I got the chance. I know on a few occasions I took my camera with me but never got it out of the backpack, so I guess you could say that part of that low image count was due to limited opportunities, and some was due to self-selection… either way, here are a few from 2018 that I enjoyed. 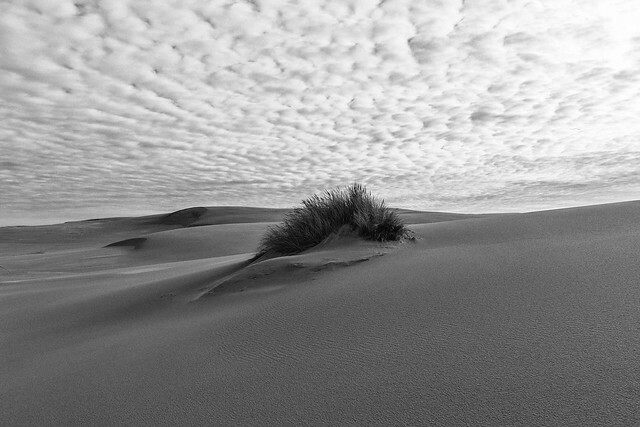 Above: Oregon Dunes, January 2018. I’m particularly happy with this image. I’d been thinking about the Oregon Dunes and how to photograph it for a while before I actually got a chance to drive down there and wander around with camera in hand. I had a pretty specific idea of the kind of image I wanted to capture, something showing the sparseness and texture of the dunes. I hadn’t really thought about black and white or color when thinking of the image, and after playing around in post-processing, I really liked how the black and white version turned out, although I do like the color version too. On this day, the cloud cover was working in my favor by adding some more character to the image. I had a fun day hiking around the dunes, grabbed a few other pictures I like, and it was well worth the long drive to get there for a daytrip. 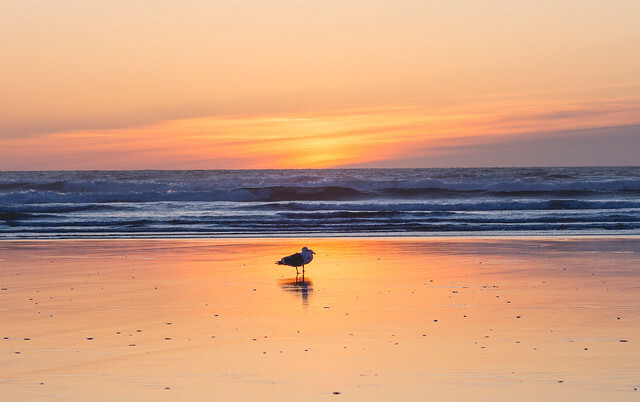 Above: Seagulls and sunset at Seaside, OR. March 2018. This image I like mainly because it was a kind of impromptu thing, and reminds me of a few nice, almost relaxing days in the middle of a very busy and fairly stressful spring. I was at a work-related training event in Seaside, and my hotel was only a few blocks from the beach. I took advantage of the nice weather we had for a few days with my first few beach jogs (found out I love jogging on the beach), and got a glimpse into what an Oregon beach town looks like during the winter off-season. I hadn’t brought my large camera setup, but I did have my Olympus and so when the sunset looked decent one night I walked down to the beach and hung out for a while. These two seagulls seemed like they didn’t mind being the subject for photographers, and they made for a nice foreground subject. The next day the weather turned back to the winter “normal” of wind and rain. Above: Foggy black and white sunrise on the Oregon coast, looking toward Florence. October 2018. Like I alluded to before, I didn’t take nearly as many images this year as I wanted to, and there was a pretty long period in the summer where I just wasn’t taking pictures. I was carrying my travel camera with me, but just wasn’t seeing much to photograph, or if I was, I wasn’t in a situation where I could bust out the camera and start snapping photos. I was working on the last big aviation project of the year on the Siuslaw NF when I took this picture. I was using my Olympus, which has some unique image properties when used in low light conditions, namely that the image gets a little noisy or grainy. While the sunrise I captured in this image was colorful to the naked eye, I really couldn’t reproduce it with the camera. But to my surprise, when I started playing around with image in post-processing, I liked how it looked in black and white. The lack of color and the grainy character just do it for me. It’s not a great image, and it’s not one that will likely end up on my wall, but I do like the way it turned out. It’s also one of the few images I have of the Oregon coast country that’s not at the beach, which is good for variety. 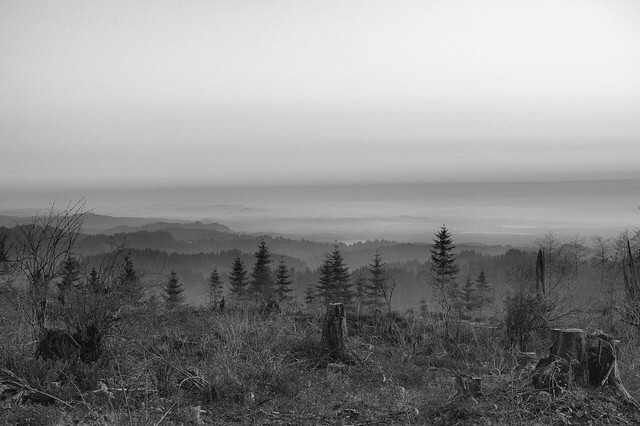 The stark feel to it, the layers of haze and fog in the foreground leading to a vacant horizon, and the combination of stumps in the clearcut with the heavily forested hills in the middle of the scene just resonate with me. 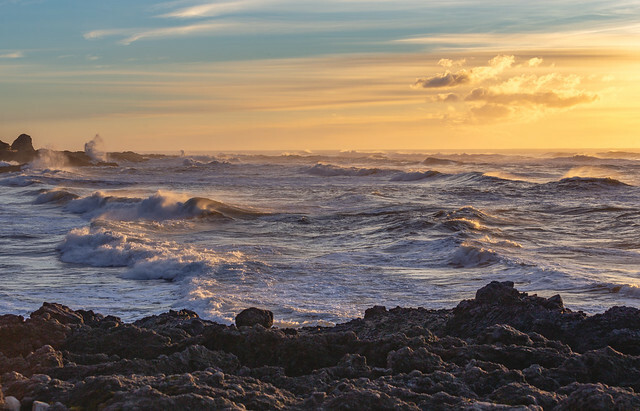 Above: Winter waves at Cape Perpetua. December, 2018. On the last day of 2018 the weather cooperated and I went for a daytrip to the coast. 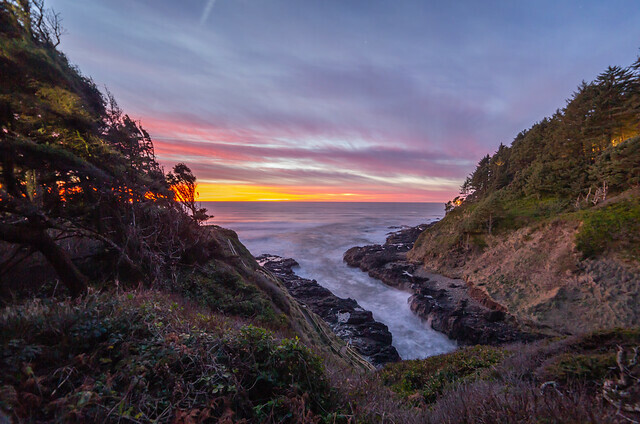 I haven’t explored much of the Oregon coast yet, but of the parts I have seen Cape Perpetua is my favorite spot. I absolutely love watching the sunset from the Devil’s Churn side of the little cove there, and on this evening the tide was rolling in and the low winter sun was illuminating things in a way that just caught my eye. Something about the way this images captures the layers of waves, and the texture of the colors really does it for me. This one is already up on my wall, and might be one of my favorite images regardless of year. 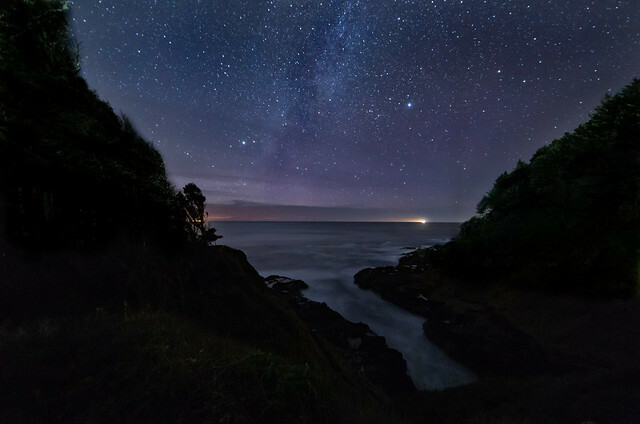 Above: Starry skies over Devil’s Churn at Cape Perpetua. December 2018. This is the second image I’m sharing from the last day of 2018, and one that while I really didn’t nail it (focus is a bit off, exposure could be better), I still like how it came out, especially considering I thought it was going to be a bust until i got it into post-processing. I’d had it in my mind for a year or so to try and get some night sky images from Cape Perpetua, and it took a while for conditions to line up with me having the time to run out there. On this day I had no idea where the Milky Way was, so it’s a happy coincidence that it’s in the frame. At sunset, the clouds had looked to be building and moving in where I wanted to frame the shot, but after a few hours it wasn’t as bad as I thought. My major challenge turned out to be the light shining into the foreground from a building at the parking lot behind me in this image… I hadn’t thought about there being a light that could disrupt my image until I got there. Fortunately, some creative editing mellowed out the effect, and the end result was acceptable. Now I’m looking forward to trying again sometime, maybe with a better night lens and some luck. Bonus round! I snapped this image a little after official sunset on December 31st, mainly to see how the framing might work for the star image above, and I actually liked the colors and motion in the ocean waves. Not my best work, but a very nice unexpected result. This entry was posted in Photography, Wild Places. Bookmark the permalink.